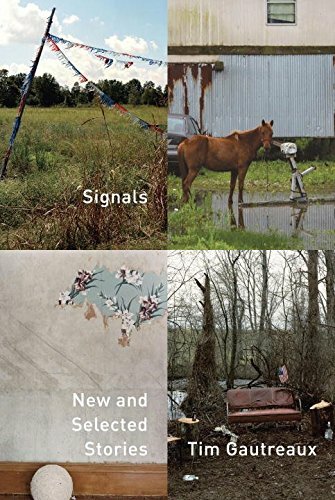 Louisiana writer Tim Gautreaux's latest offering, Signals: New and Selected Stories, collects twelve new short stories alongside nine others from his previous two collections, Same Place, Same Things and Welding with Children, resulting in a nice sample of the author's rich and unique oeuvre of Southern storytelling. It is a great starting place for newly introduced readers and a fine summation for old fans of Gautreaux's work. Like most of his fiction, the bulk of these stories deals with failed relationships, the trials of old age, matters of faith and morality, and the blue collar Cajun culture of Southwestern Louisiana. They are stories that are peopled with lonely and sometimes bitter men and women who live to fix things, but who also work to take them apart. Gautreaux is able to warmly infuse humor and wit so that his stories are never down-and-out depressing, thus comfortably eschewing the modern inclination toward nihilism and gimmicky structure and plot. In perhaps the most satisfying story of the lot, the answer to that question is an online marketplace where disgruntled customers go to review products they don't like. This is a surprisingly different tale for Gautreaux called “The Review,” in which an aspiring novelist tracks down the person who gave his first novel a one-star review on Amazon.com. The protagonist does some research on the reviewer, then drives from Louisiana to Indiana to “meet” the offending party, only to discover a fact that will change his entire view of himself and “a lifetime of bad decisions,” allowing him “to break free from the shadow of all of them at once.” Usually stories that are about writing and writers are hard to pull off without them feeling insular or trite, but Gautreaux brings the reader to near-tears with the surprising revelation in this one. The reader sees Gautreaux's characters try to answer the aforementioned existential query in other multiple ways as well: through the actions they take, the things they say (or don't say), and maybe most importantly, through the objects they collect and marvel over. In fact, there is a near worship for common objects and everyday machines in this collection, which strangely seems to be at odds with the opening story, “Idols,” (a sort of call-and-response type piece to Flannery O'Connor's “Parker's Back”) and its dire warning against idolatry. But Gautreaux does know about these things, and he knows them well. And his job here seems to be to tell the reader about them, about the “importance of objects.” For “it [is] all about connections.” Both literal and figurative. And that's just what these stories do. They serve as conduits for the reader to connect with Gautreaux's often down-and-out characters, folks about whom the author writes with compassion, clarity, and warmth. Signals is a collection that reaches beyond the South, stretching Gautreaux's “own little postage stamp of native soil” to include stories that span the geography of North America—from Minnesota, New Mexico, New York, Canada, Texas, Indiana, Ohio, and West Virginia—in order for him to communicate the vital necessity for art, for conversation, for preserving one's history through the things one collects and then leaves behind, the earthly work one undertakes. This collection of stories becomes, for its readers, “the voice of one crying out in the wilderness,” and it serves as a beacon of light and hope, a reminder of the importance of the finely honed and well-crafted tale.